Easing back into the SEO world of cpm and cpa, and various other acronyms, after ten days of beachy bliss was difficult, so I did what every avid reader does: I bought some comfort books. 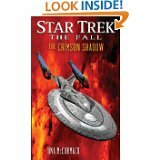 One of these was a Star Trek book: Tales from the Captain’s Table. 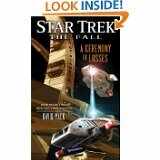 It’s a collection of short stories from various ship captains in the Trek-verse – Picard, Riker, Demora Sulu, and others, and they’re tied together by the fact that they’re all told in the Captain’s Table, a special bar with entrances from many worlds, where only ship captains are welcome. Cap, the bartender, is glimpsed in small interludes, and the bar itself reforms to the specifications of whatever a given patron expects. I like storytelling, and I like the concept of the neighborhood cafe / bar / pub, so this book appeals to me on many levels. 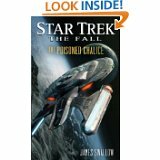 While I don’t always like short stories, in this format, they’re the logical choice. After reading this book, I felt much more at home inside my head. 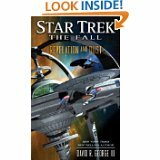 Opening very soon after the end of Star Trek: Nemesis, this novel is the first in a subseries of Pocket’s Star Trek: The Next Generation series, and is set in the first mission of the U.S.S. Titan, under the command of William T. Riker. 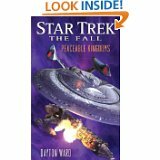 It includes a mix of characters from TNG, DS9 and Voyager, as well as some familiar faces from the A Time To… series, and was surprisingly interesting, though it was difficult to read a novel with TNG characters that didn’t include Picard or Data.